Lace is a beautiful, feminine fabric and was spotted all over Spring 2013’s runways. I saw these patterned pants and fell in love. The delicate, black lace –inspired pattern juxtaposed against a neutral background adds just the right amount of pop. 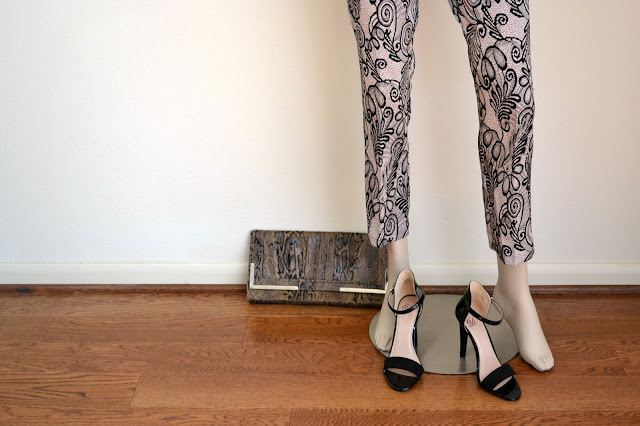 Not wanting to detract from the pants, I kept the remainder of the outfit fairly understated … a neutral silk tank; black strappy sandals; a subtle animal-print clutch and a solitary wide-band silver ring.